Ancel AD410 Review – A significant upgrade from the previous model! If you're looking for a decent scanner at a budget price, this is a great option. 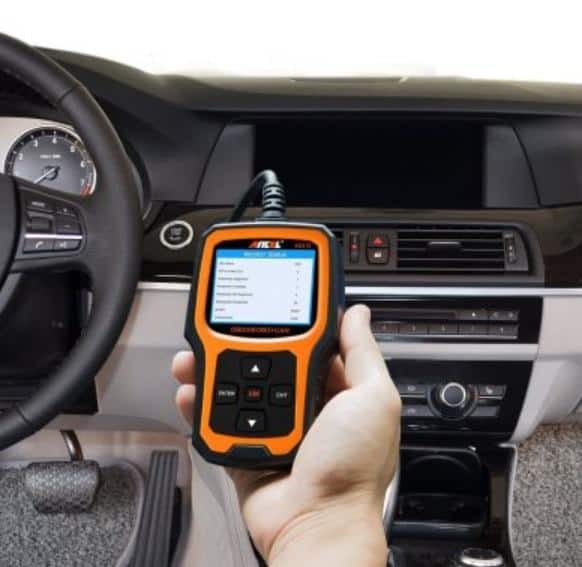 It's able to scan your vehicle, checking for codes that represent an issue, which can help you to avoid expensive maintenance trips when the issue is small. It works quickly, efficiently and can prove to be a highly useful tool. ​This scanner is small and squat. The top half is taken up by a compact color screen which is able to display simple but relevant icons and text. The bottom half contains the five buttons needed to navigate the device and perform the scans. There are grips on the side to blow you to hold the device firmly in the palm of your hand while you use your thumb to press the buttons. ​The scanner connects to your vehicle system with a cable which is permanently attached to the scanner side. The connection also provides power to the device when it is plugged in. 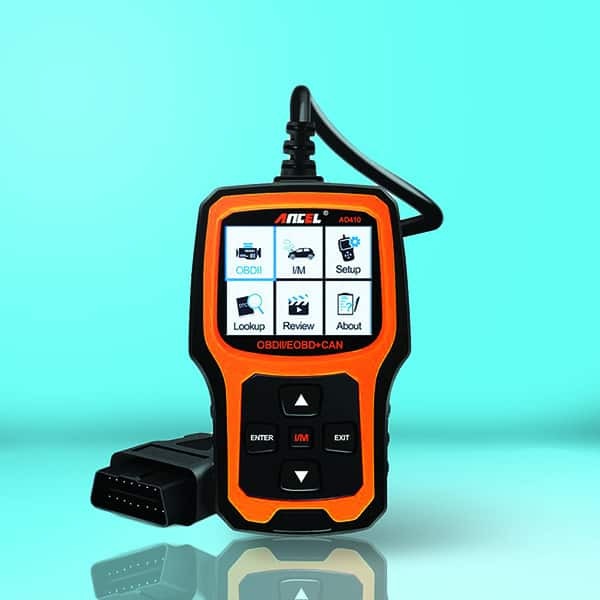 ​This device will read and check engine codes when the “check engine” light is on. After diagnosis it will display the information from the sensors and the computers in your vehicle, giving you all the information you need to know what is going on inside. You can view live data as the diagnostics are running to gain real-time information from your vehicle. To go in the opposite direction, you can also look up saved data from previous scans to see how your vehicle is acting over time. By combing the two data streams, you can gain better insight into what is causing problems in your car. This scanner gives you a brief description of the codes when they are scanned to tell you what the information means. You can then use this information to diagnose what is wrong with your vehicle and find the fix for it. 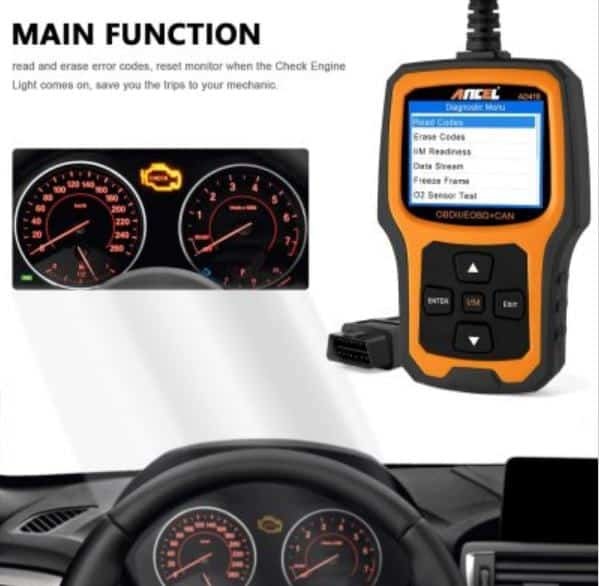 You can use this scanner to turn off the “check engine” light and clear any trouble codes. You also have a wide range of compatibility with this scanner. All of the main vehicle models are supported. You also have support for the main OBD2 protocols. By displaying some information with the scanned code, you do not need to go look up the code in the manual or online. This is a real time saver for an individual who is looking at one vehicle and a professional who is looking at many vehicles. ​As you are able to turn off the “check engine” light and clear any codes, you can save yourself from having to fix your vehicle when it does not need it. If you find that you have a problem, but it is not a major problem, then you can clear the code and light and wait for it to become an actual problem. If you took your vehicle to a professional, they would charge you for the diagnostics and then to fix the fault. The other benefit to turning the light off is that you can have the light ready to respond to any other problems which may arise. This device is limited in its functionality. The main function of the scanner is to clear engine codes. You will find that it does not offer fixes for you nor detailed information about the fault. You cannot read ABS codes, airbag codes, oil codes, stability codes, or anything else outside of the check engine light. You also have no model-specific diagnostics. The scanner paces the enter button on the left instead of the right and seems counter intuitive when you compare the layout of most electronic devices, though, this is a small problem and will not really hinder your operation of this device. You get limited code information, and you will need to go look into the problems and potential fixes. This means that you need another smart device hooked up to the internet so that you can look up the code and find a fix. If you are an amateur mechanic, this may make fixes daunting, and you may want to take your car to a professional anyway. This is a scanner for checking the engine light and turning it off when needed. If you work in a professional environment, then you will use this to complement other scanners. If you are an individual, then it is a great device for checking the engine light when it comes on. It will save you money over time, and you will gain a basic understanding on how your engine is working, but it may not aid you in fixing your vehicle.